The holiday shopping season is here, but there are some products a consumer advocacy group is urging parents to stay away from. Cabbage Patch Kids dolls, Pillow Pets and Nerf guns may seem like good holiday gifts for children, but one group is warning otherwise. World Against Toys Causing Harm, also known as WATCH, released its 2018 top 10 list of "worst" holiday toys and featured all of the above. 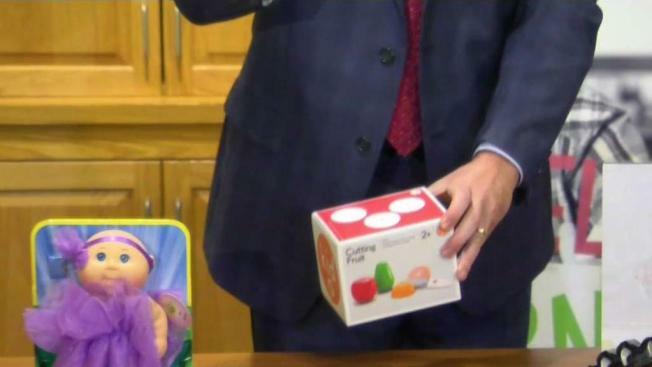 The nonprofit organization says the toys included in its list pose choking hazards, risk blunt injuries and have the potential to cause facial injuries. For more than four decades, WATCH has released these lists to warn parents of the potential dangers that come with their children’s selection of toys on their holiday wish lists. Nickelodeon Nella Princess Knight Pillow Pets Sleeptime Lites for its "potential for ingestion and battery-related injuries"
Nerf Vortex VTX Praxis Blaster for its "potential for eye injuries"
Marvel Black Panther Slash Claw for its "potential for eye and facial injuries"
Power Rangers Super Ninja Steel Superstar Blade for its "potential for blunt force and eye injuries"
Cabbage Patch Kids Dance Time Doll for its "potential for choking injuries"
Zoo Jamz Xylophone for its "potential for ingestion and choking injuries"
Nici Wonderland Doll: Miniclara the Ballerina for its "potential for choking injuries"
Stomp Rocket Ultra Rocket for its "potential for eye, face and other impact injuries"
Cutting Fruit for its "potential for puncture and blunt force injuries"
Chien Á Promener Pull Along Dog for its "potential for entanglement and strangulation injuries"
WATCH presented its list on Tuesday at Franciscan Children’s Hospital in Boston. The Consumer Product Safety Commission reports an estimated 240,000 toy-related injuries happened in the U.S. in 2016. Between January 2017 and October 2018, an estimated 3.5 million units of toys were recalled in the U.S. and in Canada, according to WATCH. The Toy Association disagrees with the non-profit's claims. "Each year, WATCH's dangerous toys list needlessly frightens parents and caregivers," the Toy Association said in a statement. "By law, all toys sold in the United States must meet 100+ rigorous safety tests and standards." Wicked Cool Toys, which manufactures the Cabbage Patch doll that was named in WATCH's list, said safety is their priority. "We take safety very seriously, and all of the products we bring to market have been through and passed all required safety testing," their statement said. The manufacturer reminds consumers that all toys sold in the U.S. are required to exceed safety testing before hitting store shelves. Hasbro, which manufactures the Nerf Vortex and the Black Panther claw, also said their top priority is safety. "Our products comply with all applicable global safety laws, regulations and standards, including those enforced by the US Consumer Product Safety Commission," Hasbro said in a statement. PlayMonster manufactures the Cutting Fruit set and also said they take consumer safety seriously and that it is their priority. As for the Miniclara the Ballerina doll, a NICI representative said the toy is safe for children. "This plush kitten is fixed to a plush bag with a 5mm polyester woven tape," a NICI representative said in a statement. "Because the product passed the physical tests necessary to receive the allowance to be sold to consumers we are confident that the product is safe." Vtech says WATCH's list unnecessarily inflicts concern onto guardians. "This dangerous toys list, released annually before the holiday shopping season, is biased, inaccurate and greatly misinforms the public, needlessly frightening parents and caregivers," a Vtech spokesperson said in a statement. "Toymakers and The Toy Association are committed to toy safety year-round," the Toy Association said. "These efforts include providing useful tips for families and caregivers to help them choose age-appropriate toys and ensure safe play." Toy manufacturers CJ Products, D & L Company and Janod; Juratoys did not immediately comment on the list. Toys that were featured in 2017’s list included a Wonder Woman sword, fidget spinners, a Spider-Man drone and more.